Rookie smokejumpers practice dropping from approximately 35 feet at up to 15 miles per hour on the Let-Down Simulator at the McCall smokejumper base in McCall, Idaho. The system is designed to help smokejumpers learn how to land in rough conditions during fire season. 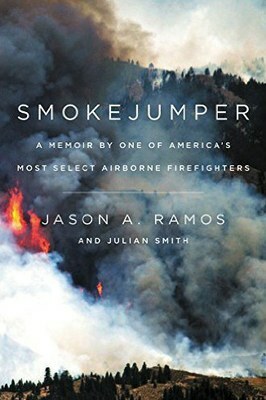 In Smokejumper, veteran firefighter Jason Ramos chronicles the history of the elite group of airborne firefighters who attack blazes in some of the West’s most remote and rugged country. Smokejumpers are equipped to handle any situation, in any terrain, at any time, and since 1939, they have battled wildfires from Fairbanks, Alaska, to Silver City, New Mexico. Ramos calls his comrades “the Swiss Army knives of firefighting,” justifying that moniker with an array of colorful anecdotes. At the same time, he explains the ecological importance of wildfires, pointing out the natural regenerative role that they play. Smokejumpers have to be tough, and so their rookie training school must be even tougher — comparable to the Navy SEALS program. Despite a serious leg injury, Ramos passed. Ramos’ instructor was unsympathetic: “ ‘I’m pushing as hard as I can,’ I said. His answer was brutal in its honesty. ‘I don’t care,’ he said. ‘You better pick it up. On a fire it doesn’t matter if you’re hurt.’ ” Ramos eventually parachuted into some of the biggest fires in recent history, including the devastating 2014 Carlton Complex in Washington. Ramos describes historic fires and assesses recent beasts, including the 1994 South Canyon Fire, the 2001 Thirtymile Fire, and the 2013 Yarnell Hill Fire, explaining how these turned so deadly and noting the lessons that firefighters learned from them. He jabs at the way bureaucracy often hampers missions; some fire chiefs hesitate to call in jumpers, hoping to save taxpayer dollars. Unfortunately, the problem is larger than local municipalities — Congress doesn’t allow the Forest Service to draw on disaster funding outside its normal budget for firefighting, and the agency already spends almost half of its entire budget fighting fires. That takes money away from other programs, including those that might prevent fires or mitigate their impacts.